The videos below were captured during our final week of work. The first is a short snapshot of the latest-dating well at the site. Installed by tenant farmers working land owned by James LeCompt, this well dates to the 1870s and was built using robbed Houston house materials. Note the intact barrel at the bottom! The second video was taken from 50 feet above the ground surface and shows the spatial layout of the wells, outbuildings, roasting pits, house cellar and root cellar, as well as Boyd’s Corner Road and finishing with a view of what will soon be the Route 301 corridor. We at Dovetail want to thank everyone who helped make this dig possible. Goodbye, Houston-LeCompt site! We will miss you. Greetings from our new adventure, the Armstrong-Rogers site! On Wednesday, September 19th, archaeologists from Dovetail Cultural Resource Group commenced our data recovery on this eighteenth-nineteenth century historic site. Research indicates that the property was owned by the Armstrong family from 1739 until 1824 and the Rogers clan from 1824 through the 1850s. Tenant farmers then used this property for several more decades. 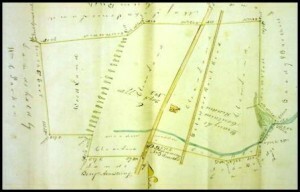 An Orphan’s court map from 1855 shows a two-story building with an interior-end chimney located here, a mere 100 feet north of Drawyers Creek. This incredibly detailed map and estate narrative provides a wealth of information on this area! The Armstrong-Rogers site was first identified by Hunter Research in 2010 and was the subject of Phase II testing by Louis Berger in 2011. Thanks to the stellar work of both of these firms, we were able to immediately relocate some exciting early finds at this site, including a stone foundation and artifact loci. Test units were placed in a checkerboard pattern across the foundation area, and several other units were put in place over areas of interest noted during the previous work. Through this process, a second stone foundation was noted northeast of the known feature. Interestingly, whereas the Hunter/Berger foundation is oriented perpendicular to the roadway, this newly identified foundation is oriented north-south. Hmmm….. Work will continue at this site for several more weeks, including completing the test units, stripping the topsoil, mapping all features, and then excavating the notable finds. The two stone foundations will be explored, and they may give us a better understanding of why Alexander Armstrong, James Rogers, and their families had building’s erected so close to the creek. A curious site indeed, and we are very excited! 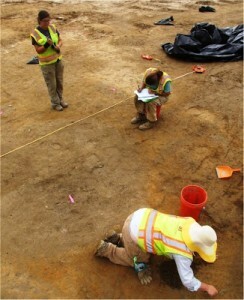 At the Bird-Houston Site we spent all week excavating features. On the newer part of the site, where people lived from around 1830 to 1920, several of the features are shallow pits filled with brick rubble. We think these are the remains of brick piers, a simple kind of foundation you can still see at many old farms throughout Delaware. When a building was abandoned or replaced, the intact bricks were often salvaged to be used in another project, and the broken pieces were tossed back into the hole. So shallow pits full of broken bricks are a common kind of archaeological feature. After we dug all the brick rubble out of one of these features, we got a surprise. The soil underneath was not clean subsoil. It looked disturbed, with many small patches of dark gray soil. After digging around for a while we figured out that the gray patches were tunnels. Our first thought was that these were groundhog tunnels, since groundhogs are the great tunnelers of rural Delaware. But the tunnels seemed small for groundhogs. Then we found these bones. 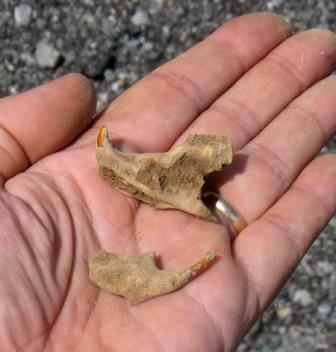 They haven’t been examined by an expert yet, but they certainly look like a lower jaw and broken skull of Rattus norvegicus, the brown rat. So the tunnels were rat tunnels, and the disturbed soil was evidence of a rat nest. This confirms our theory that the brick feature was an old foundation, since brown rats almost always live underneath buildings. Using clues from the wild species around a site to understand human culture is called environmental archaeology. So we have just done a little bit of environmental archaeology ourselves, using the presence of a rat nest to confirm the location of a building at the Bird-Houston Site. 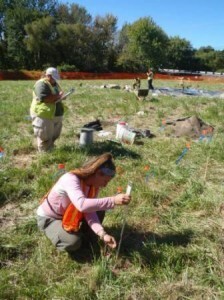 At the Bird-Houston Site we spent much of the week working on an archaeological mystery. 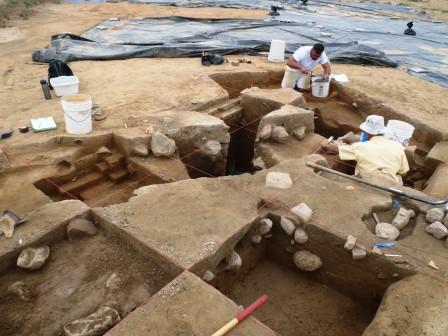 The largest feature on the site is this pit, which measured about 10 by 11 feet. One quarter of the feature was dug last year during the testing phase. This showed that the pit was roughly cone-shaped, and that it was intentionally filled in sometime around 1800. But what was it? Nobody had a convincing theory, except maybe that someone started digging a well or cellar and then gave up without finishing. This year we dug more of the feature. After shoveling out several hundred pounds of silt we discovered that what we thought was the bottom of the pit was not. It was a layer of soil that looked like the natural subsoil, but someone had dug it up and dumped it into the pit. Below this layer was more soil like the layers above. The pit had a false bottom, and the archaeologists had been fooled by it. So the crew kept digging, and eventually they found the edge of the feature started diving straight down. 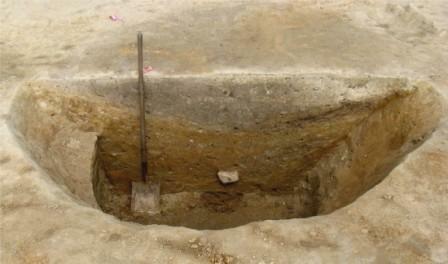 The lower part of the feature is a shaft, almost certainly a well. Sometimes archaeologists can tell what a feature is just by glancing at it, but sometime the only way to know is to dig all the way to the bottom. Well, well, well… At the Cardon Holton site we almost made it to the bottom of the well using conventional hand excavation but with two feet left to go the side walls from the original cone of excavation started to fissure and made further investigations unsafe. With assistance from the backhoe we were able to retrieve the four corner posts and the plank sidewalls. The posts were hand-hewn with an adze and the ends pointed with an axe. Two of the longer posts exhibited a drilled hole about 5 feet up from the base and one retains bark, which should provide a good candidate for dendrochronology. No signs of cross members were visible suggesting perhaps the holes were used to lower the partially constructed box into the hole. The sides were fashioned from large logs, split with a froe forming wedge-shaped planks (some also with bark). The planks were pinned onto the corner posts with small wrought nails and held into position by a layer of clay and the pressure of the surrounding soil. All of the wooden remains were washed and observations were recorded before wrapping the saturated specimens in clear plastic wrap and then stored under a dark tarp to retard fungal growth. Excavation of the main root cellar recovered several straight pins, egg shell, fish scales, small lead shot and bits of gunflints. Last week at the Cardon/Holton Site the Hunter Research Inc. crew worked hard removing the remainder of pits started last week. The pit with the juvenile articulated pig turned out to be more complicated than we first thought. The articulated bones only represented the limbs of one, possibly two pigs with the upper portion of a skull from a larger mature pig. 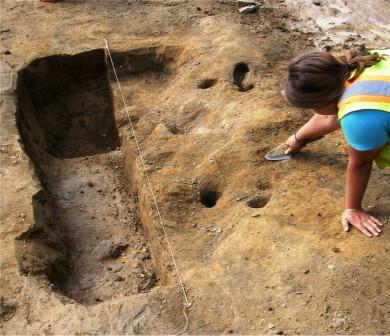 These bones may represent pieces of meat from a feature thought to be a smokehouse. Why the limbs would remain articulated is a bit of a mystery we don’t have an answer for at this time. Another nearby pit exhibits reddened soils at the base resulting from fire (likely for cooking) as evidenced by fire-crack rock and chunks of charcoal. 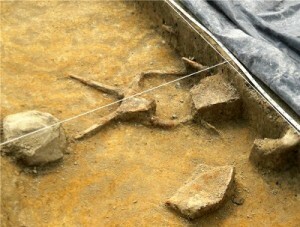 The pit was flanked by a pair of medium-sized posts which likely suspended a cooking vessel such as a cauldron. Several pieces of cast iron cauldrons were found in the vicinity during the Phase IB survey. Excavation in the shaft feature thought to be a well, have proven fruitful as the clear outline of a square four-foot wooden shaft has evolved. Artifacts recovered from the site thus far seem to indicate the site was abandoned by around 1740. Recent research indicates William Cardon passed away prior 1737. His son also William Cardon, a minor became a ward of Boaz Boyce who later ends up with the property. It also appears that the property is occupied for a short period by a tenant, Robert Whiteside in 1742. Hopefully additional research will provide insights and answers to the new questions generated by the archaeology. At the Bird-Houston Site we spent the first part of the week mapping and photographing our features. Before they start excavating Archaeologists always make a careful record, by drawings and photographs, of whatever they are going to dig into. And then the payoff – actually digging into the features to find out what they hold. So far we are finding ceramics, glass, and a few other things from the 1770 to 1820 period. One pit holds an assortment of badly rusted iron artifacts. The slightly curved object in the lower right is a thin sheet, folded over, and it may be the iron tip from a wooden shovel. We don’t have any good guesses yet about the others. Kevin McCloskey (left) and John Potts (right) help excavate the cellar at the Houston-LeCompt site. Nine weeks down, one to go! In our second to last week of full-scale excavation at the Houston-LeCompt site, the Dovetail crew grew in number and moved a lot of dirt. Several archaeologists fresh off of the great work done by Richard Grubb and Associates at the Rumsey-Polk site came north to help us complete our dig. With the extra hands—and several days without rain and ensuing flooding — we were able to commence excavation of all non-post features. The circa 1770s Houston-era cellar continues to take shape, as we exposed more of the brick walls as well as a bulkhead cellar entrance on what was the east side of the house. Eighteenth, and early-nineteenth century fill deposits contained an amazing amount of personal artifacts including unique glass, enamel and brass buttons, gun flints, and even a mid-eighteenth century trade token. The Houston’s were certainly people of means….or at least liked pretty things! Elsewhere we uncovered several architectural refuse piles, trash pits, and burn features, all of which continue to help us understand more and more about life here in the eighteenth through twentieth century. 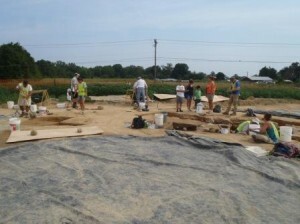 Beyond the digging, this site has also continued to be an locus for modern anthropology, as volunteers and other guests continue to come by the site. Some happen to drive by and wonder what we are up to; others are long-time residents who are thrilled to help excavate history in their own backyard. Watching as a volunteer, young or old, finds their first artifact and realizes they are the first person to touch that piece in over 200 years is priceless. We only have one more week to finish up our dig. Wish us luck! Volunteers, tourists and archaeologists work together to explore the site and share in the excitement of the archaeological process.